BeatsX, the wireless earbuds featuring Apple's W1 chip, made their debut on the market, after months of waiting, back in February for $150. Several months into the year and the in-ear headphones have already been discounted by 33%. For the first time after their release, the BeatsX earbuds are available for purchase for less than $100. 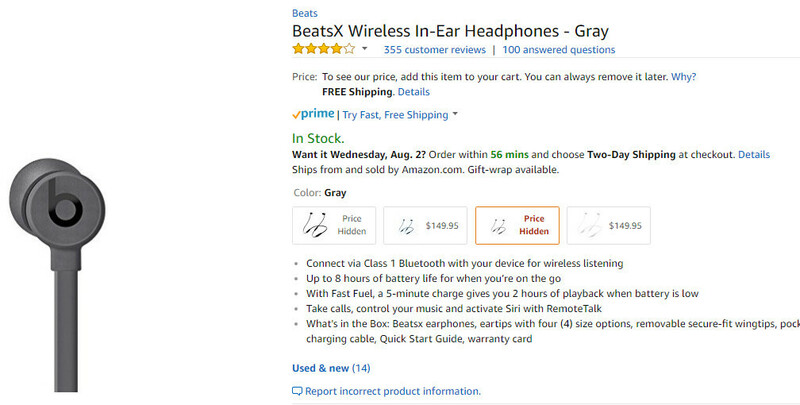 Amazon has both the Gray and Black versions of the headphones on sale for just $99. Even though the retailer has the price hidden, adding the product in the cart will reveal its discounted price. Keep in mind that the Blue and White models haven't been discounted, which means you'll have to pay the full $149.95 price. The BeatsX wireless in-ear headphones promise to offer up to 8 hours of battery life. Moreover, a 5-minute charge you'll be able to get you around 2 hours of playback when the battery is low. Also, they're supposed to offer the same sound experience as Apple's AirPods, but that's for everyone to judge for themselves. If you do plan on getting the BeatsX earbuds, you might want to act now since the deal might not last too long. Get the Jaybird X3s. They're sweat resistant, have good battery life and I can guarantee you have better sound than these garbage Beats branded earphones. LOL, the Powerbeats³ literally blow those Jaybird's away plus they stay in your ear even through the most vigorous workouts. And, the newer Beats have flattened out the frequency response to give a much more refined and balanced sound stage. Jaybird's are all sibilance with no warmth and they immediately slide out of place as soon as the sweat starts to roll. Beats haters will never die! Actually the Beat's X are pretty decent earbuds. They are no where near garbage and have great sound. But wht sets these apart from the others is they have excellent noise cancelling when on calls. I've just about used them all and these cancel background noise when on a call like a champ. People tell me that they can barley hear background noise when I'm in noisy environments. I'd definitely get these at this price, you get the best of both worlds with good sound and superior call quality. i love them. I was expecting to be disappointed but they really surprised me. Wouldnt pay more than 100$ for them but priced 99$ they are worth it. They dont stick out much out of your ears like other bluetooth headphones, great fit and seal, and 5 min charging gets you 2 hours playtime. And the sound quality is really good. Also these sound better than the jaybird x3. Would not even buy them for 10$ Sound quality is pretty crap!